The History of Fun explores the hidden backstories behind the things you enjoy. This season, we’re diving into the amazing origins of your favorite holiday traditions. Join Polygon’s Russ Frushtick, Allegra Frank, and Chris Plante each week as they embark on a new quest to uncover these common-yet-mysterious customs. Produced by Polygon and the Vox Media Podcast Network. There is a war. It's been going on for hundreds of years. And there's only one victim: CHRISTMAS. Chris Plante dives deep into The War on Christmas. Where it started, why it started, and out frickin' ridiculous it is. A brief history of The Yule Lads and The Yule Cat of Iceland. A brief history of Black Friday. A brief history of Krampus, the anti-Santa. Chris Plante dives deep into the fascinating origins of Trick or Treating. We're excited to announce that we're doing an extra special second season of The History of Fun, all about the origins of our favorite holiday traditions. Trick or treating! Krampus! The Icelandic Yule Cat! Season 2 of The History of Fun will kick off on Monday, October 29. See you then! While this episode is focused on both Brookstone and The Sharper Image, we all know which one sold full-sized replicas of The Predator, so we're just gonna go ahead and call this The Sharper Image episode. This also happens to be the very last episode of the first season of The History of Fun. But worry not! We'll be back in the Fall with a brand new season of fun stuff, probably involving surprisingly grim stories from Allegra. This week on The History of Fun, Allegra regales us with the origins of Karaoke and the man that made it all happen. Pro-tip: Make sure you're really good if you ever try to sing "My Way." Alright, it's a Saturday night, it's 1995. What are you gonna do? Well, you're probably going to leave the lights on because you're watching ARE YOU AFRAID OF THE DARK? and other SNICK classics. This week, Chris Plante joins us to talk about Nickelodeon's classic programming rock block of All That, SpongeBob and more. Just when you thought it was safe to go back to the water parks. Today Allegra Frank brings you the twisted history of waterparks and where they came from. She also decides to focus on some pretty grim stuff, so if you're a little squeamish about injury or death, you may want to, uh, come back next week? Anyway, FUN! This week on The History of Fun, Allegra Frank fills us all in on the origins of MANGA and its biggest franchise: Shonen Jump. Yes, if you've always been perplexed about the world of manga, this is the episode for you. And if you're already a fan of manga, there's a fair chance that we mispronounce at least one thing in this episode. Not Allegra, though. She's a pro. This week we welcome special guest Matt Patches to discuss the history of Mission Impossible, from its origins as a Cold War-era TV show to the every-4-years film franchise we've come to know and love. We thought we'd look back given that the sixth (and final? who knows!) movie, Mission Impossible: Fallout, comes out on Friday. Whether it's Drug Wars or that weird penguin platforming game, the TI-83 calculator had something for everyone! On this episode we welcome special guest, Jon Bois of SBNation, to talk about the magic and wonder of gaming on a calculator, while also occasionally using it for schoolwork. Fair to say that Texas Instruments has a pretty good scheme going. With Chris Plante on vacation we welcome none other than Colin Campbell, resident soccer expert (so much so that he calls it football! ), to talk about the origins and some of the wacky moments from the history of the FIFA World Cup. Let's all take a moment to celebrate a dog named Pickles. On this, the week of America's independence, we celebrate the ability for humans to consume low-grade meat at extremely fast rates. Chris Plante digs into the surprisingly-fraught history of the world famous Nathan's Hot Dog Eating contest, as well as its most famous (and controversial) competitor. Quite possibly the world's most famous cat (take that Garfield), Sanrio's Hello Kitty is a juggernaut. But where did this strange cat without a mouth come from? And could it be possible that she's NOT A CAT BUT RATHER A HUMAN GIRL? Yeah, things get weird, thanks to Allegra Frank and the rest of your friends at The History of Fun! It's the most well-known gaming conference, but its humble origins may surprise you! This week we're diving into the history of E3, home to Sonic, Mario and all your friends. Chris Plante is on the case, covering the story of the show from start to finish. Even if you don't care about football and don't give a hoohah about Jonathan Madden and his bus-loving stylings, the story of the biggest sports game franchise ever is quite a yarn! Join Chris Plante as his spins this pigskin into a, I don't know, football or something! This week we're exploring a very specific part of the Pokemon phenomenon: Pokemon Cards! Where did they come from? Are they still around? What do they have to do with Magic: The Gathering? Allegra Frank tells all! This week on The History of Fun we're inviting friend of the show and resident wrestling expert, Patrick Gill, to talk about an infamous moment in wrestling history, but don't don’t let this man distract you from the fact that in 1998, The Undertaker threw Mankind off Hell In A Cell, and plummeted 16 ft through an announcer’s table. There was once a time where countries would throw these raucous, baller parties just to show off how dope they are. They were called World's Fairs. And although they technically still exist, they really don't. Russ looks back and celebrates some of the greatest World's Fairs ever held. Long live the Tennessee Wigsphere! The wackiest (and most disasterous) Nintendo console of all time goes under the microscope! Who's bright idea was it to create this silly helmet contraption in the first place? Will it make you go blind? And what's with all the red? Chris Plante uncovers the truth. Neopets seem to be popping in the news lately, so we thought we'd shift this episode up a little bit in our schedule so y'all could learn the truth behind the craze that swept the internet. Allegra takes the wheel and fills us in on her penchant for pet theft, as well as the connections between Neopets and Scientology. Enjoy! It's fair to say that no toy in the history of the world has caused more carnage than the trampoline. Seems like a perfect fit for Allegra Frank, who clearly hates them but decided, yet again, to pick something she hates. Join her and us as we soar to the highest of highs and then break our bones upon landing. Ah, those gloriously-needy little egg babies! Today Russ is delving into the history of Tamagotchi, from their humble origins as aliens found in a lake by a lonely man to a worldwide juggernaut to something that some people remember sorta. Sorry I wasn't able to figure out how to type a backwards R here. Anyway, Chris Plante is back in action, sharing the epic origins of Toys R Us. Unfortunately this episode was RIPPED FROM THE HEADLINES as Toys R Us just completely folded earlier this month, but hey, let's all remember them fondly! Because sticking wheels on your feet wasn't dangerous enough, today we welcome special guest Abby Russell from Giant Bomb, to talk about the history of roller derby. What could be more fun than the Oreo cookie? Today we welcome special guest Daniela Galarza from Eater as she discusses the origins of the Oreo as well as what the future holds! This week we explore the humble origins of the Lego Building Block, thanks to special guest Clayton Ashley! Denmark was forever changed, and you will be too! What kid didn't love making a weekly trip to McDonald's for a chance at a transforming shake toy? Today we're looking at the history of the McDonald's Happy Meal. This episode was very obviously not sponsored by McDonald's. What a tangled web this starchy toy has weaved throughout the years. Sit back and let Chris Plante fill you in on the sorted adventures of Mr. Potato Head and his brood. Get ready to lose your shirt! This week Russ takes us into the scaly underbelly of the origins of poker. Matt Damon rejoice! All you need is a rope, two hands, and a dream. Let Allegra Frank lead you through the history of the mighty jumping rope! What happens when a game gets delayed? And delayed? And delayed again? Let Chris Plante tell the sorted tale of Duke Nukem Forever, the game that never was and then suddenly actually was. Wintertime is upon us. How long have people been hitting the slopes? Let's find out! The world has never seen a device quite like the N-Gage. Actually, that's not true. There was a second one. Why, oh, why, you ask? Allegra Frank is on the case! If you've never heard of it before, prepare to be introduced to one of the most incredible and over-the-top theme parks in the history of the world: Tokyo DisneySea. Take it away, Chris Plante! This week we explore one of the most well-known shooters of all time: GoldenEye 007 on the N64. Join us as we dig deep into the insanely disaster-prone, understaffed team that managed to pull off the impossible. In this episode, Allegra Frank explores the skyrocketing highs and the horrifying lows of the Beanie Baby phenomenon of the mid-90s. Where did they come from? Where did they go? Will they ever return in greater numbers? Yes, before there was BitCoin, there were Beanie Babies. In this episode, Chris Plante delves into the seedy underbelly that was the production of Street Fighter: The Movie, starring Jean-Claude Van Damme. He promises drugs, booze and celebrity scandal. In short, Ryu would be ashamed. I feel like no one reads this, but in case you're super bored and reading this instead of the bathroom graffiti, maybe you wanna take a minute to review our lovely podcast on Apple Podcasts / iTunes? It would mean so much to us! In today's episode we explore our very first video game: Super Mario Kart. Yes, the very first entry in the long-running Mario Kart series isn't exactly the most beloved, but it's good to know where it all came from, right? Right? On today's episode, Allegra takes the reigns and walks Russ and Chris through the dangerous origins of the game most known as Dodgeball. Where did it come from? Who is fighting against it? Why was Chris Plante such a target in elementary school? All will be revealed. Whether you spent time there as a child or it just haunts your dreams when you close your eyes at night, Chuck E. Cheese is a mainstay of American culture. Today we explore the hidden wonders / horrors of Chuck E. Cheese and its famous singing robots. Ah, Monopoly, the game that lasts forever and makes you hate your friends. In their first episode, Russ Frushtick, Allegra Frank and Chris Plante explore the origins of the Parker Bros. game from hell. Ever wonder who came up with the idea for Monopoly? Or where the Chuck E. Cheese robots come from? Or what caused the downfall of the Beanie Babies? 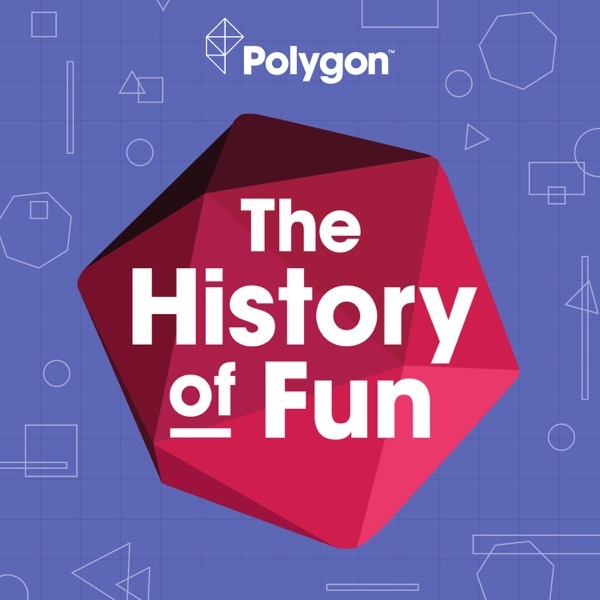 Join Polygon's Russ Frushtick, Allegra Frank and Chris Plante on a weekly journey of discovery called The History of Fun.